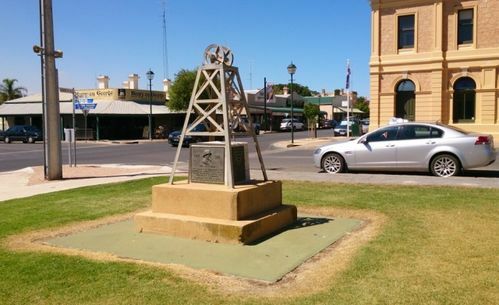 A monument commemorates the discovery of copper in the Moonta District in 1861. Large and rich deposits of copper were discovered at Moonta in 1861 by shepherds from Walter Watson Hughes' sheep farm. This became a prosperous mine, named Wheal Hughes, with other mines soon to follow. The town was laid out in 1863 and a horse-drawn tramway to Wallaroo was established in 1863. Following advertising by the South Australian Government, Cornish miners arrived in Moonta soon afterward. The mines at Moonta proved to be the richest mines in the whole of South Australia by 1917, exceeding the total wealth created by all other mines since 1836, the year of establishment of South Australia. The population of Moonta in 1875 was 12,000. The primary copper mining operations ceased in 1923, but smaller-scale operations recommenced in the area in the 1990s, and ended 2 years later. This memorial was promoted by the Moonta Workers Club Inc. to commemorate the discovery of copper in the Moonta District in May 1861. It was presented to the town of Moonta by the Hon. R. S. Richards J.P. and accepted by the Mayor R. K. Butler Esq. on behalf of the citizens on May 13th 1961.